That blog post, however, was only my opinion. And one of the great things about book blogging is that there are so many opinionated people from all kinds of different backgrounds and with all kinds of different experiences. 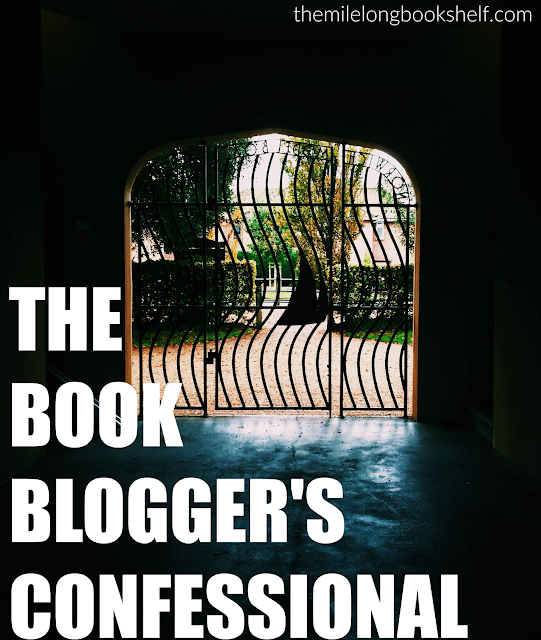 So a while ago I decided to set up an online form where bloggers could anonymously reveal anything that irks them about book blogging... and today we're going to hear from them. Welcome to the Book Blogger's Confessional. I only read two bigger blogs these days; the rest are smaller and newer, and they're great. R E L A T A B L E.
It's never too late! Just keep at it. 'where do I even start. I love book blogging, I really do - but it frustrates me how book bloggers are the underdog in the blogging world in terms of making a (semi?) career out of it. beauty bloggers and fashion bloggers and travel bloggers and parent bloggers are flown round the world and given opportunities book bloggers could only dream of. when anyone brings up their opinion on book bloggers being paid there is outrage and that isn't fair at all. Keep going! 5 months is a very short amount of time. And not every book blogger receives books to review. Review your own for now, and hopefully you'll get noticed. Meanwhile, there's lots of other cool stuff you can do: Twitter chats (I recommend #teenbloggerschat...), making friends, entering giveaways, interacting and generally having fun. Same except I don't think I'll ever get to all of them hahahahahaha help. Book blogging looks easy from the outside, but like many hobbies and professions, there are hidden pressures and negative aspects that you'd have no idea about until you're doing it yourself. Are you surprised at these 'confessions' or did you find yourself nodding along in agreement? I feel the same way! There have been times I've thought "why am I doing this if no one is going to read it?!" ... but then I remember the reason why I started blogging in the first place and that's to add diversity to the types of books being shared and reviewed. Keep it at it but I definitely feel like the struggle for small/new bloggers is real!! Honestly, I'd have trouble naming more than one "big" blog at this point. I think there were more five years ago when my co-blogger and I first started blogging. Maybe I'm just out of the loop because blogger turnover is so high and it's hard to keep track of who's gone for good and who is new, but are there big blogs who look down on smaller ones? And are there cliques? I've noticed that people tend to comment in the same types of groups but I always assumed that people with similar tastes were attracted to similar blogs. I understand, however, why publishers don't give ARCs or review copies to blogs with small numbers. It's not that some people write bigger reviews, it's that that can expose the book to more people. The marketing department has limited funds to promote a book. If I had to sell an author, I'd give a review copy to someone who could reach 1500 people rather than a blogger who could reach 70. It's a business transaction where you get something because you are providing a service to the publisher. It's not meant to be a personal indictment about anyone's writing skills. I honestly don't even know who the big book bloggers are, no matter how many times people refer to them, so if someone could fill me in, that would be great. :p I've been blogging for nearly six years now, and the "big" bloggers shift around as much as anyone else. So I might have known a couple big blogs three years ago, but they're not even active anymore. I have no idea who's big now. As for review copies, I think what we really need is an insider's look at a marketing department in a publisher. I get the feeling we're all sitting around feeling guilty about not reviewing books we didn't ask for, but I have the sneaking suspicion that the employees sending these things are perfectly aware that might happen. They must think it's worth sending the book and *maybe* someone will feature it on their blog, and that that is a better use of their time and publisher money than making a curated list for every blogger. I don't know, of course, but it would be great if we had more insight on this. As for getting paid, most book bloggers simply don't get the page views for it to be worth it. Not every beauty/travel/lifestyle bloggers get paid--just the biggest ones. Plenty of those bloggers are doing it just for fun, just like us. But if you're a big lifestyle blogger, you probably get 10X more traffic than a big book blogger. Why should someone play me to write a review that I might get 30 people to read? I'm actually all in favor of book bloggers getting paid, but we need to be worth it. If someone can spend their budget in limited ways, they're going to spend it on advertising that gets way more hits and visibility than most book blogs do.